Market volatility remains elevated, in part because of confusion over comments by Washington officials re-Sino/U.S trade war this week. The supposed de-escalation of trade tension coming out of the G20 seem to be somewhat misleading and has led to aggressive selling of risk assets and the buying of sovereign bonds. The VIX has jumped back above 25, and the U.S Dollar has come under modest pressure. The U.S 10-year yield has slumped to +2.8%, level not seen since this summer. The 2-year yield has fallen even faster, resulting in benchmark steepening despite a continued inversion at the belly of the curve (2/10’s +13 bps). Trade tensions between the world’s two largest economies – U.S and China – just got trickier with the arrest of the CFO and daughter of the founder of Huawei, in Canada, at the request of the U.S. The U.S has been probing Huawei over possible violation of sanctions against Iran. 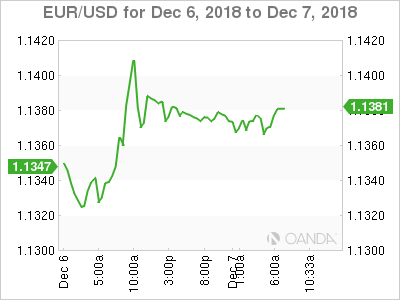 Chances of a no-deal Brexit are slim but uncertainty looms for the pound because the U.K parliament looks unlikely to approve PM Theresa May’s Brexit deal – voting in the U.K Parliament to begin 14:00 ET on Tuesday, Dec 11. Expect Sterling to continue to trade very nervously. Bank of England (BoE) on Brexit Scenarios: GBP currency could fall -15% in disruptive and -25% in disorderly Brexit. On the commodity front, oil prices continue to remain on the soft side, pressured by a further build in U.S inventories this week. Fearing a glut, OPEC is considering supply cuts at this weeks meeting (Dec 6-7). Russia remains the key, Moscow could contribute a maximum of -150K bpd cut, but the Middle East-dominated OPEC insists Russia cut by -250K-300K bpd. Yesterday’s +179K increase in the ADP measure of private employment in November supports the theory that the official non-farm payrolls figures due this morning will show a similar 190K+ gain. That would represent a slowdown from October’s reading, but should still be enough to convince the Fed to raise interest rates again later this month.